This week’s song is not making a deep theological statement…at least not one I could identify after my initial 25 listens. I first heard Baby Monkey (Going Backwards On A Pig) when it was a free download on iTunes last year. I LOVED it immediately…yes, I’m strange like that. As soon as I played it for my kids it was quickly set to auto-repeat and we drove around town singing it at the top of our lungs. Team Allen in all our glory. I believe there’s a strange genius to this song as well. 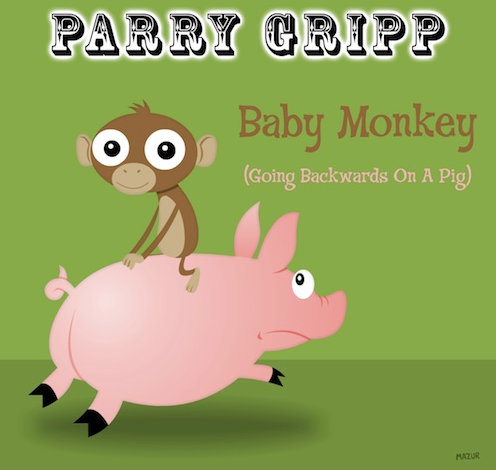 Parry Gripp didn’t stop at singing about a baby monkey, or even a baby monkey riding a pig. No, this baby monkey is riding backwards on a pig. If you listen closely you’ll even find an encouraging message in the verse. We all need a loving reminder to keep trying even when life is hard, and to do that while riding a pig…well that’s just freakin’ awesome! I recently found a YouTube vid with the song and some exciting baby-monkey-going-backwards-on-a-pig action. You.Are.Welcome.